Goodbye 2018 and hello 2019! 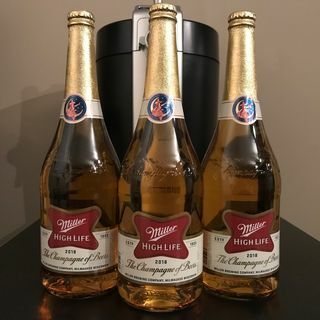 Grab the Champagne of Beers and ring in the new year with some Miller High Life champagne bottles! Hopefully everyone had a great Christmas and holiday season, as we are putting a bow on another year in the world of bumwinebob.com with the annual Bumming with Bobcat State Of The Union Address! In 2018 we said goodbye to our friends at SFD Radio and made the switch from BlogTalkRadio to Spreaker. Hopefully we can get back on track with live podcasts and call-ins in ... See More the future. Maybe take the show on the road? Let me know what YOU want to hear! We saw a major malt beverage takeover in 2018 and it looks like more will be coming in 2019 with the new Steel Reserve Alloy Series Spiked Tropic Storm set to debut on January 1st 2019! After being shut down by the WWE, could we see new BWB merchandise in 2019? Due to popular demand, Tall boy Thursday in the books being extended for the NFL playoffs! What's on tap for 2019? Updated site layout and new features coming to the site! More podcasts and more guests! Krude, Oregon malt addicts, behind the bar reviews, selling out podcast, and much more! Want to be a guest? Send me a message! The Bumming with Bobcat Patreon page is coming soon where you can help support us while gaining access to special bonus content and extra goodies!